Time flies. It's been one year since I first started posting and it's been a bit like my paper diaries!! Eye-wise, interesting things have happened. A year ago I posted about Demodex and using Tea Tree oil or systemic Ivermectin to kill them. If you can compound Ivermectin cream that works even better and does not sting. I have found a few patients with what appears to be seborrhoeic dermatitis and also happened to have lots of Demodex in their eyelashes. Somehow I managed to cure their skin problem which had usually been causing trouble for years. The Ivermectin cream killed the mites in the lashes as well as in the skin and the rash disappeared. This rash was typically erythematous (reddish) macules and sometimes could be slightly scaly. it was often in the brow and nasolabial fold and had not responded to previous courses of steroids and other treatments. In the picture below you can see the rash between the brows and at the side of the left upper eyelid in one patient. Recently also we have been seeing a spate of microsporidial keratoconjunctivitis. Often the story was of playing rugby or football on a muddy field (it has been raining a lot over the past one month) and getting muddy water splashed into the eye. Gardeners have also been affected. Their eye became red and teary about a week after contact with the contaminated water. 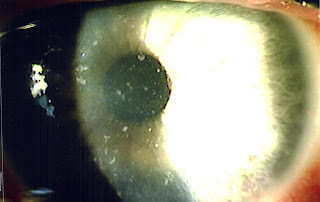 On the front surface of the eye (cornea) the patients developed tiny white spots like in the picture below. So far all our patients have recovered with antibiotic eyedrops. I think the main issue is not to confuse it with viral conjunctivitis and start with steroid eyedrops too early, since this can prolong the infection somewhat. Viral conjunctivitis is usually redder, with more discharge and stickiness in the morning and there is usually no history of contact with dirty water. The rugby players at Turf City have gotten so familiar with this that they are going to see the doctor, and telling the doctor the diagnosis even before being seen!